The great Spotshot sprayer now comes in two versions to fit your individual needs. Pump - Shurfloâ pumps are designed for heavy duty spraying application. Viton valves with Santoprene diaphragm are compatible with most present day horticultural chemicals. Low volume and high pressure (85psi) makes Spotshot the number one choice for horticultural use. Battery - 12 volt sealed lead-acid type, is rechargeable and maintenance free, which allows for a full day of spraying. A battery charger is included. Wheels - Industrial type 8” diameter wheels with tires mounted on “no rust” high impact polypropylene wheel. Built for long life and no rust. Tank - Five (5) gallon high-density tank with 2 ¾” opening. Graduation marks by Gallon make for accurate volume needs. Easily interchangeable. Extra tanks available. Construction - All aluminum powder coated frame with an ergonomically designed handle for easy maneuverability. Shipping Weight - Approximately 39 pounds. Shipping is Free to lower 48 States. Call for shipping prices to Canada, Hawaii, and Alaska. SpotShot Sprayers are widely used by Residential and Commercial applicators for Insecticides, Herbicides, Fungicides and Fertilizers. 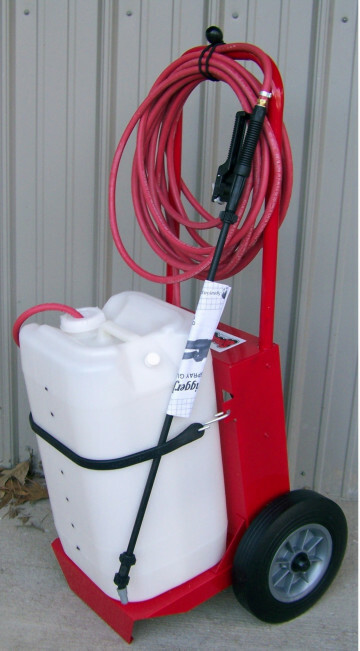 We at Rosemania have been looking for the perfect battery powered sprayer to offer our loyal customers. The Spotshot was our choice.